The National Principal of the Year program recognizes outstanding school leaders who have succeeded in providing high-quality learning opportunities for students. These principals are acknowledged by their peers for the exemplary contributions they have made to the profession. The program honors high school principals who have demonstrated excellence in the areas addressed by the selection criteria. Nominations are now closed for the 2019 Principal of the Year. Questions? 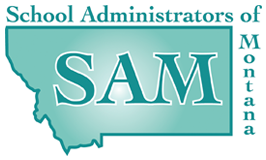 Contact Kimberly Scofield, Director of Member Services and Professional Learning at [email protected] or by phone at 406-442-2510. On January 28th at the Montana Principals Conference, sponsored by the Montana Association of Secondary School Principals (MASSP) and the Montana Association of Elementary and Middle School Principals in Helena, the MASSP Principal of the Year was announced. The award recognizes outstanding leadership of active, front-line principals who have succeeded in providing exceptional learning opportunity for students. Mr. Joel Graves, Principal at Lincoln County High School in Eureka, was selected as the recipient of the 2019 Montana Association of Secondary School Principals’ (MASSP) Principal of the Year at annual Montana Principals Conference held January 27-29 in Helena. This prestigious award recognizes outstanding school leaders who have succeeded in providing high-quality learning opportunities for students as well as demonstrating exemplary contributions to the profession. Mr. Graves has made a strong effort to assist students in receiving college credit while in high school by enrolling in dual-credit courses. He not only strives to improve himself but has provided many opportunities for teachers to connect with students in a positive way and implement methodologies and techniques for making Lincoln County High School and a better learning environment. Mr. Graves has also provided positive leadership while serving on the MASSP Board of Directors as Vice President, President-Elect, President, and now Past President. As the 2019 Principal of the Year, Mr. Graves will represent Montana at the national level as a contender for the National Principal of the Year award. Each of the 50 states, the District of Columbia, the U.S. Department of State Office of Overseas Schools, and the Department of Defense Education Activity select one middle level or high school principal to represent their state as a contender for the National Principal of the Year award given in October by the National Association of Secondary School Principals (NASSP). Through the National Principal of the Year program, NASSP wishes to recognize success, inspire greatness, and celebrate excellence in our nation’s schools. The members MASSP and SAM congratulate Mr. Joel Graves on receiving this prestigious honor.